AECOM Corporate (Middle East) recently presented Absal Paul with a Certificate of Achievement for ‘exceptional HSE standards’ on the Nabors Arabia Project in Dammam. 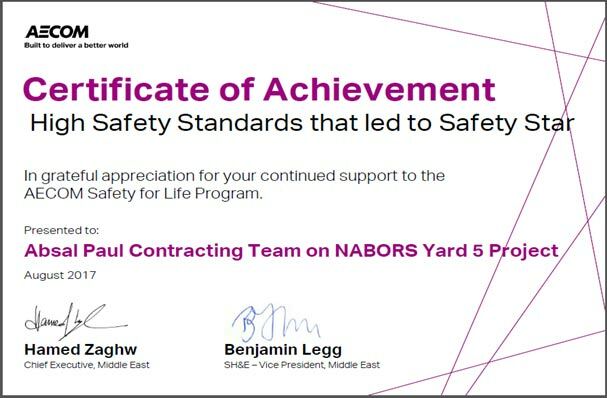 The achievement is a reflection of the hard work and commitment to safety of the Nabors, AECOM and Absal Paul project teams. Absal Paul place the health and safety of all involved in their projects as their number one business objective. This is achieved through the implementation of the company Safety Management System (SMS) and the continued commitment and efforts of staff and management teams to improving health and safety across all projects and places of work.